Exhibitions > Temporary Exhibitions > Quipu: Counting with knots in the Inka Empire – 2003 > Quipus and numerical values > Does the quipu was analogous to a system of calculation? 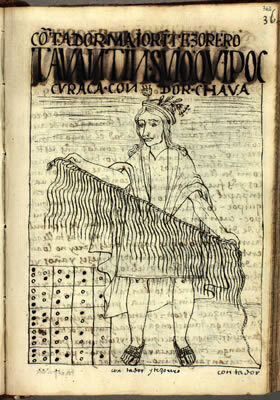 Quipucamayoc with a quipu and an Andean calculation board, called yupana. Drawing from the indigenous chronicler Guamán Poma de Ayala . The quipu was never used as an instrument of calculation. Years of study show that the numerical values identified in the quipus were calculation annotations made through another system. Researchers believe that one of the methods that the Incas had to make accounts was using small stones for more complex mathematical operations by a kind of ‘abacus’, called yupana. The results of those calculations would have been after recorded through quipu knots.